Discover amazing H1Z1 battle royale plays from eSport events, streamers, and casual players. Each play video is handpicked by our website visitors. 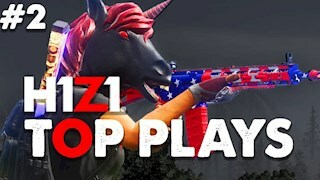 Whatever mode you enjoy playing, you'll find the best and most amazing plays here on Battle Royale Plays in this H1Z1 gameplays video's page. H1Z1 is considered by many as the Battle Royale game that started it all. It's a battle royale shooter that sports a massive map where players are always in search for weapons, ammo, vehicles, and useful items that will help them survive longer on the battlefield. The game started as two separate projects, with H1Z1L King of the Kill becoming H1Z1. H1Z1 started as a paid game and became a Free to Play game on February 2018. The game was initially released for PC and later releases for PS4 and as of the time of writing, it's pending release for Xbox One. In H1Z1 you can play solo, duos or fives and fight to be the last one standing. The game has plenty of customization unlocks and a large variety of weapons. In July 2017, a new arcade mode called Scavenger Hunt was released where players search the map for rare items scattered around the map which rewards them with high-quality rewards. H1Z1 also has a Pro Leauge where professional H1Z1 players fight for honor and fame. In this page, you can find H1Z1 Battle Royale gameplay videos and the option to vote for the ones that you like best. You can submit URLs of Twitch Clips and VOD videos, as well as YouTube videos. You can also pinpoint the exact time frame for the gameplay within the videos, so people can watch only that specific play that you want to highlight. Visit us daily to discover new amazing H1Z1 Top plays, share your favorite plays and discuss them with the community, all here in Battle Royale Plays.